Today the Supreme Court will hear arguments in The American Legion v. American Humanist Association concerning the forty-foot tall the Peace Cross at a traffic junction in Bladensburg, Maryland, just outside Washington, D.C.
Peace Cross in Bladensburg, Maryland, 2009. The cross is a memorial to American solders who died in World War I. It was completed in 1925 and is now maintained with government funds. The Fourth Circuit of Appeals has ruled that this makes it unconstitutional because it “excessively entangles the government in religion.” While the Bladensburg cross was reportedly directly inspired by a wooden cross that marked the grave of an American solider in France, the name “Peace Cross” is shared with another, older, Washington-area monument. On October 23, 1898, President William McKinley attended the dedication of a Peace Cross marking the end of the Spanish-American War. It was erected by Bishop Henry Yates Satterlee on the newly purchased grounds of Washington National Cathedral. It was the first monument on that site. seven miles to the east. The Lord is our God, the Lord is One. You shall love the Lord your God with all your heart and with all your soul and with all your might. Take to heart these instructions with which I charge you this day. Impress them upon your children. Recite them when you stay at home and when you are away, when you lie down and when you get up. Bind them as a sign on your hand and let them serve as a symbol on your forehead, inscribe them on the doorposts of your house and on your gates. The Shema concludes with the recitation of Deuteronomy 11:13-21 and Numbers 15:37-41. In class we usually just focus on the words in Deuteronomy 6. When we discuss the commandment to “bind them as a sign on your hand” and “inscribe them . . . on your gates.,” I mention that this has shaped the traditional Jewish practice of wearing small boxes containing scripture (tefillin) during daily prayer and hanging a container containing it (a mezuzah) on the door post of homes. I also mention that it has shaped the front gate of their own university. The university, then known as Howard College, moved to its new campus in Shades Valley in 1957. Promotional drawings show that a gate such as graces the main entrance was part of the master plan. However no gate was built until after the college became a university by acquiring Cumberland School of Law and was renamed, in 1965, in honor of the chair of its board of trustees, insurance executive Frank P. Samford. In gratitude for honor, Mr. and Mrs. Samford donated front gate bearing the school’s new name. Detail of undated photo published in Corts, Legacy of Gratitude, 34. In the late 1980s, President Thomas E. Corts grew troubled by these words. He explained in his memoir, “lawyers had taught me that ‘agency’ has special legal consequence, and the Convention would likely not want to position itself to accept ascending liability.” Convention leaders agreed and Corts replaced the agency sign “with the best quotation I could think of, a foundational statement, the statement Jesus made in response to the question: ‘What is the great commandment? '” (Corts, Legacy of Gratitude (2007), 34). The famous passage appears three times in the New Testament. Given sign’s relatively small size, Corts chose the most concise version, Luke 10:27. “Thou shall love the Lord thy God with all thy heart, and with all thy soul, and with all thy strength, and with all thy mind; and thy neighbor as thyself” (Luke 10:27, King James Version). Photo: David R. Bains, September 2004. Perhaps to support the change, Corts often referred to the passage as “the Shema,” thus emphasizing its root in Deuteronomy 6 and its commandment to write God’s words “on your gates.” Referring to the passage as the Shema, however, causes confusion to those who know Hebrew or the Jewish tradition. As we’ve seen “shema” is the simply the Hebrew word for “hear,” and the passage on the gate and in the Gospel of Luke does not begin, “Hear, O Israel.” Also while the commandment to “love thy neighbor as thyself” is esteemed in Judaism just as much as it is in Christianity, it is not part of the Shema. It comes from Leviticus 19:18. Among Christians, the passage on the gate is more commonly referred to as the Greatest Commandments or the Summary of the Law. Given the fluidity of biblical tradition, the three gospels each differ from Deuteronomy and each other in either the number, the names, or the order of the human faculties to be used to love God. Yet, this is not an accurate quote from Mark in the King James Version. Mark includes “mind” between “soul” and “strength.” The mace omits it. The explanation of the mace that has often appeared in the program for commencement exercises states that “the cylinder bears the Shema,” yet provides the words of the Shema as “Hear O Israel, the Lord is our God, the Lord is One.” (Commencement Program, December 2014, p. 3). In Mark 12, Jesus does begin his recitation of Deuteronomy with “Hear O Israel,” but those words do not appear on the cylinder. The authors of the commencement program, knowing that “the Shema” is on the mace, correctly identify the opening words of the text in the Jewish tradition but by so doing wrongly identify the words on the mace. Using the Hebrew name is a nice acknowledgement that Jesus’ greatest commandments are from the Hebrew Bible. But giving the word Shema a different meaning than it has in the Jewish tradition by including Leviticus 19:18, and omitting much else especially, “Hear O Israel,” sows confusion. 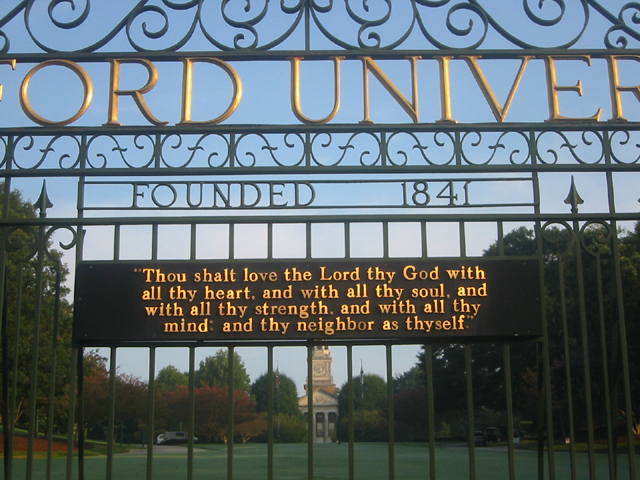 Fortunately, the habit of refering to the commandments on Samford’s gates as the Shema seems to have run its course. Attention instead has focused on the link between the first commandment on the gate and Deuteronomy 6:5. In the 2009 revision of the university’s belltower logo, the hands of the clock were positioned at 6:05 in reference to Deuteronomy 6:5. In explaining this fact Inside Samford (Spring 2016, p. 20) said that it was Deuteronomy 6:5 that was inscribed on the gate, quoting it correctly from Deuteronomy (but incorrectly from the gate) as “heart, . . . soul, and . . . might.” In Seasons, President Andrew Westmoreland also said it was Deuteronomy but the quote he provided was actually Matthew’s version “heart, . . ., soul, . . . mind” (Spring 2016, p. 2). Since the front gate cannot be accessed by pedestrians and the scripture cannot be safely read by motorists on Lakeshore Drive it is not surprising that various understandings of what is on its sign have emerged. The version Corts chose seems best for a university since it includes “mind” and emphasizes it by placing it last. The hands of the clock could be set at 10:27 in reference to the actual text from Luke that is used, but at that angle the hands of the clock might be more distracting from the logo’s clean lines. Founded in 1842 or 41? Careful viewers of the photos of the gate above may have noticed that originally the gate said “Founded 1842,” but that now it has been altered to read “1841.” Indeed the fact that the final “1” in the 1841 looks different than the first suggests that the final digit has been altered even without seeing earlier photographs. 1841 on the Main Samford Gate, in the snow on December 9, 2017. Howard College held its first classes in January 1842 and the year 1842 appeared on its seal which can still be seen in the tympanum of Davis Library or the marker near the library at the site of the flag pole given to the school by the class of 1964. The State of Alabama, however, granted Howard College its charter on December 29, 1841. This 1841 date was used on the 1955 cornerstone for Samford Hall in 1955. During the administration of Dr. Corts, the date on the seal and on the gate was changed to 1841 in keeping with the common practice of universities and colleges to claim as their founding date the year in which they were chartered, not the year in which they first held classes. At inaugurations and other ceremonial occasions, universities are often listed in order of founding, thus by claiming the 1841 date, Samford is now ahead of other schools founded in 1842 including the Citadel, Ohio Wesleyan, Villanova, Willamette, and, most notably, the University of Notre Dame. Feb. 21, 2019: Statement that the gate originally had no functional gates across the roadway has been removed. I’m grateful for correspondence from David Henderson, class of 1971, informing me that there was some kind of gate used to enforce curfews for female students while he was a student. In his 2007 memoir, Dr. Corts mentions that early in his presidency there were no functional gates until they were installed in the early 1990s. This marker honors the memory of Harry, college janitor and servant of President Talbird. At midnight, October 15, 1854, he sustained fatal injuries as he roused sleeping students form the burning college building in Marion, Alabama. Alarmed by the flames and warned to escape for his life, he replied, “I must wake the boys first.” Thus, he saved many lives at the cost of his own. In the cemetery at Marion is a handsome marble shaft erected in honor of Harry. It is right that Samford remembers Harry. Had the loss of life in the fire been more extensive, the thirteen year-old college might have simply folded. Instead the school, then known as Howard College and located in Marion, Alabama, built a new campus, now the site of Marion Military Academy. While the college closed during the Civil War, it was revived afterwards and in 1887 moved to the booming Birmingham area. The university proudly celebrates that it is the 87th oldest college in the nation, but this marker is one of the few objects that links the current campus, opened in 1957, to the town where the college spent its first forty-six years. Unfortunately, however, I know more than one person in the Samford community who has been misled by the word “servant” in this inscription. They have come away thinking Harry was a free man. He was not. He was the enslaved servant of President Talbird, one of nine human beings Talbird owned. The memorial Baptists erected in his memory in Marion stated that “he illustrated the character of a christian servant faithful unto death.” As a friend said to me the other day, despite the fact that Harry defied the warning to flee from the fire, his own life was not his to give. Thankfully, Samford publications on the 150th and 160th anniversaries of the fire have clearly explained that Harry was enslaved. Unfortunately a more recent mention on the university’s website refers to him only as “servant.” When Alabama Baptists identified Harry as “servant of H. Talbird”” on the obelisk they placed above his grave in the Marion cemetery, they knew he was enslaved and were confident that others would too. I expect the same was true when the tablet on the present campus was inscribed to echo the Marion monument. But to describe him as something other than an enslaved person is to detach our selves from the reality of his life. Virginia is my home state. In 1619 those first Africans were sold at Old Point Comfort in my hometown of Hampton. It is the same point of land where my grandfather first arrived in Virginia by steamship a little more than three hundred years later. In fourth grade Virginia history, I learned that 1619 was a “red letter year,” because Africans and English women arrived and the first legislature met. And yes, I learned that those Africans were sold as “indentured servants” not as slaves. I have no doubt that Northam learned the same thing from the same 1957 Virginia history textbook that we used in Hampton. As Rebecca Goetz, author of The Baptism of Early Virginia: How Christianity Created Race (2012), explained in the wake of Northam’s comments on Twitter, there was an absence of laws concerning slavery in Virginia in 1619 and in the early decades of the colony enslaved Africans exercised paths to freedom more easily than in later decades. Historians in the 1950s used this absence of laws to argue that the first Africans in Virginia were indentured servants, a status shared by many early English immigrants to Virginia. More recent historians have shown that to be false. I worry that members of the Samford community might gain the same impression from the Harry memorial, or worse yet not understand that Samford’s early history is intertwined with slavery. My alma mater, the University of Virginia, is currently constructing a large Memorial to Enslaved Laborers on prominent site on the University’s world-renowned Grounds that they helped build and maintain. While Samford is now located 78 miles from the campus Harry and other enslaved people helped maintain, and probably helped build, it has had a memorial to an enslaved laborer on the center campus for decades. It is important that it is understood as such. Harry as depicted on Samford University’s 1994 silver mace. Photo by Paul Aucoin.